Specifications: blades 24" notched or smooth on 9" spacing, cast iron spools, 1 1/2" square hi-carbon steel gang rods, triple sealed gang bearings, extra heavy wall steel tubular frame, 3" x 12" hydraulic lift cylinder, 7.60 x 16 6-ply tires. Seven sizes from 7'6" to 12'0". Weights: 3167 to 3967 pounds. Options: blade cleaners and rear utility hitch. Features: split axles allow regulating the depth of cut for left or right side, hitch turnbuckle adjusts depth of cut for front or rear gangs. Tractor power required from 50 to 120 pto horsepower. 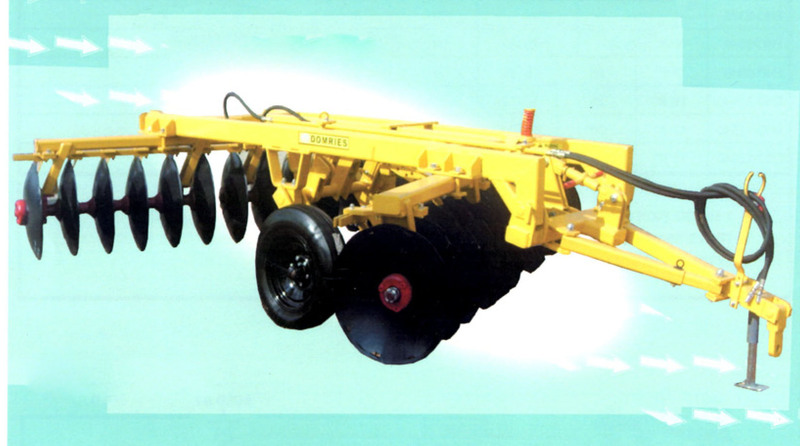 A rugged construction wheel-controlled offset for small farms.